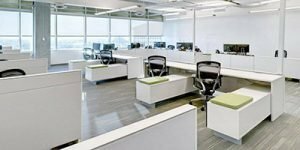 Being an office relocation company in Phoenix has given us insight into how to safely and efficiently move office furniture. However, it’s your fellow employees that make the biggest difference when it comes time to relocate your office. We have compiled some of the responses from our clients into this post to provide additional foresight. The Time Has Come to Relocate! As the time for a renewed office space approaches, it is the perfect time to renew employee spirits as well. It is too easy to take people for granted in these times of the bottom line, and nothing makes an office worker nonproductive like being in a rut. As the days run into one another, the repetitiveness of the job can make a person feel like just another cog in the wheel. If the truth be told, they are. How many wheels could function without their cogs? As the company relies on the employees from day to day, make sure they know that they are, in fact, very important parts of the bigger picture. A move is an excellent time to renew that commitment to them, and boost the moral for a fresh start. Start the process with a special “Office Relocation Meeting”. Bring doughnuts and coffee, and start out by making the announcement. To begin lifting morale, engage each employee in the details. Ask for suggestions as to how they could make the move go smoothly. By doing this, every person will feel as though what they think really matters. Keep a checklist of preparations on a bulletin board and invite each employee to sign up to oversee each task. The more the employees are involved, the better they will feel. While the IT department will oversee the relocation of computers, there is still a wealth of files to be attended to. Ask for a small team to take charge of packing and labeling the paperwork. Set a moving goal, and display it so everyone can keep an eye on progress. As moving day approaches, and everything is packed and ready for the movers, hold another meeting. A discussion on meeting set-up goals is in order. Deadlines are important to prevent lost production and revenue. This is the time to assign desks and set the tone for the new office. Many places frown on personal items in the workplace, but a more comfortable environment helps raise spirits. Discuss allowing photos, plants, and other personal items within reason. Never forget how much time every day the employees spend at these desks. Lessening the cold, cookie-cutter feel of the area will bring dramatic results. On the first day in the new office, have your teams arrive early to set up. The smoother this process goes, the happier everyone will be. A stressful first day with people not knowing what to do will set the tone for years to come. Make sure everyone is engaged and placing their personal touches. The more the new office reflects their tastes, the higher the morale will be. They will feel as though the new office is really theirs, and their production and enthusiasm will reflect it.